"India. 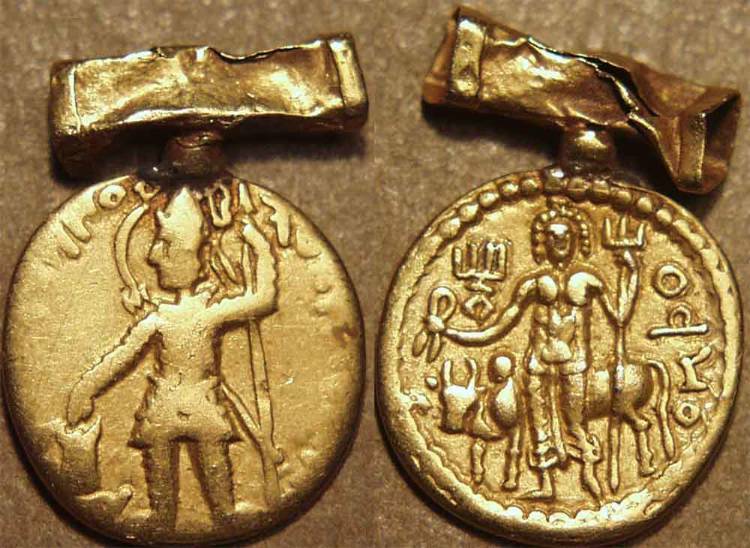 Kushans. 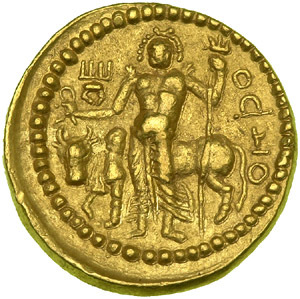 Vasudeva I, c. 164-200 AD. Gold Dinar (8.02 g). Vasudeva standing left at lit altar. Reverse: Shiva stands, holding trident, Nandi bull behind." "KUSHAN KINGS of INDIA. 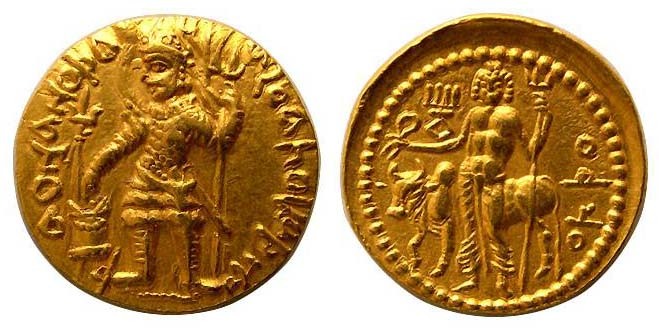 Vasudeva I. Circa 164-200 AD. AV Dinar (7.96 gm; 21 mm). King standing left, sacrificing at altar, trident standard behind / Siva standing facing, holding trident, the bull Nandi standing behind; tamgha above." 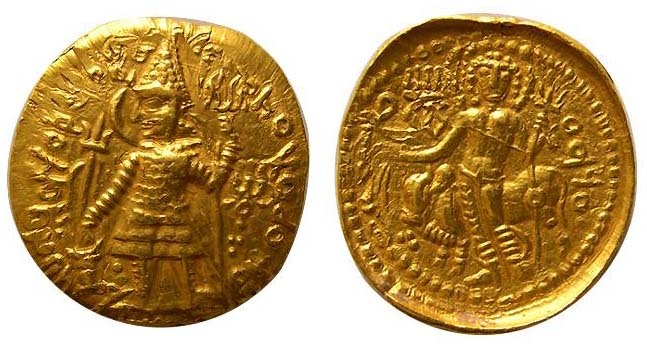 "Vasudeva I. Circa 164-200 AD. AV Dinar (7.95 gm; 23 mm). King standing left, sacrificing at altar, trident standard behind / Siva standing facing, holding trident, the bull Nandi standing behind; tamgha above." "KUSHAN KINGS of INDIA. 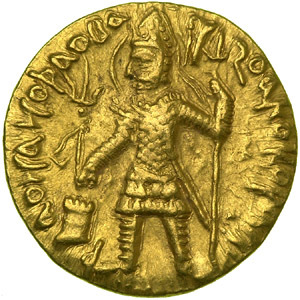 Vasudeva I. Circa 160-240 AD. Gold Dinar (8.90 gm; 20 mm). King standing left, wearing conical crown with nimbus, holding trident and sacrificing at altar, trident standard behind / Three-headed and four-armed Siva standing facing, holding trident, diadem and poppy, the bull Nandi standing behind; tamgha right, below." 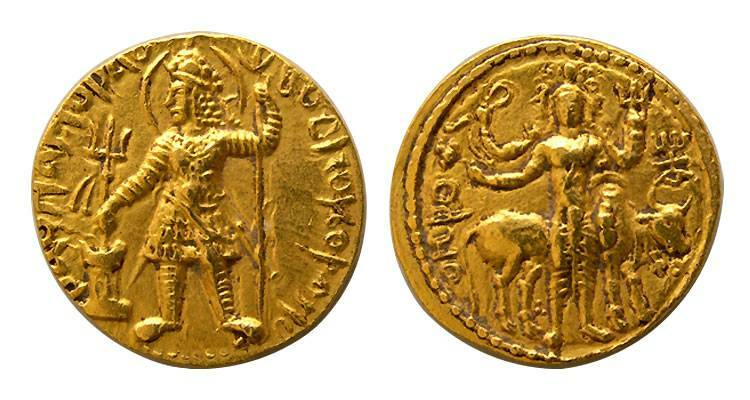 "Kushan: Vasudeva I Gold quarter dinar. Obverse King standing facing, nimbate and with flames on shoulder, sacrificing at altar at left, Bactrian legend around: þaonanoþao Ba...zoaho Koþano. Reverse Oesho (Siva) standing facing, holding trident and diadem, Bull Nandi behind, legend at right: Ohþo, tamgha at left. Date c. 191-226 CE. Weight 1.97 gm. (including suspension loop). Diameter 13 mm. Comments Used in a necklace. From wear it appears the Siva side was on the outside."